I can’t even express to you how obsessed I am with this BLT dip. One of my co-workers at my old job made the pre-lightened up version of this for an office potluck and it was practically devoured before everyone had even made it out of their offices to eat. 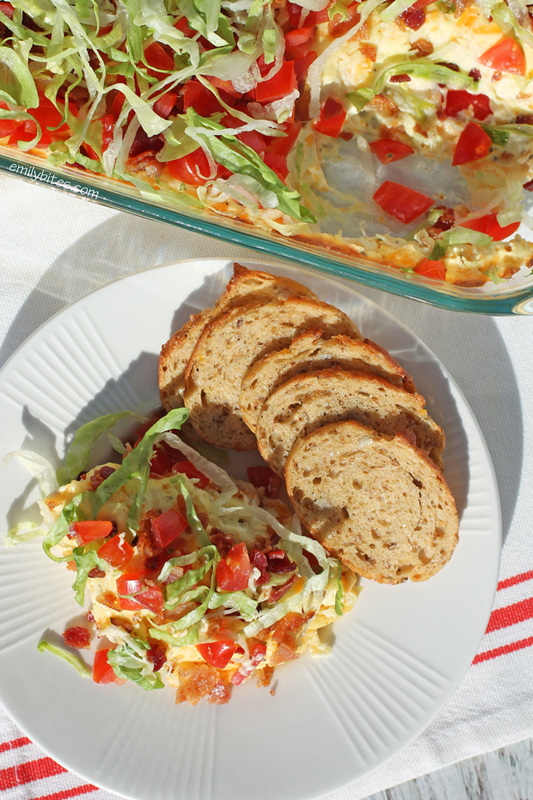 I begged him for the recipe, and since then I have made this BLT dip for tons of occasions and every time people have raved about it. It’s just that good. 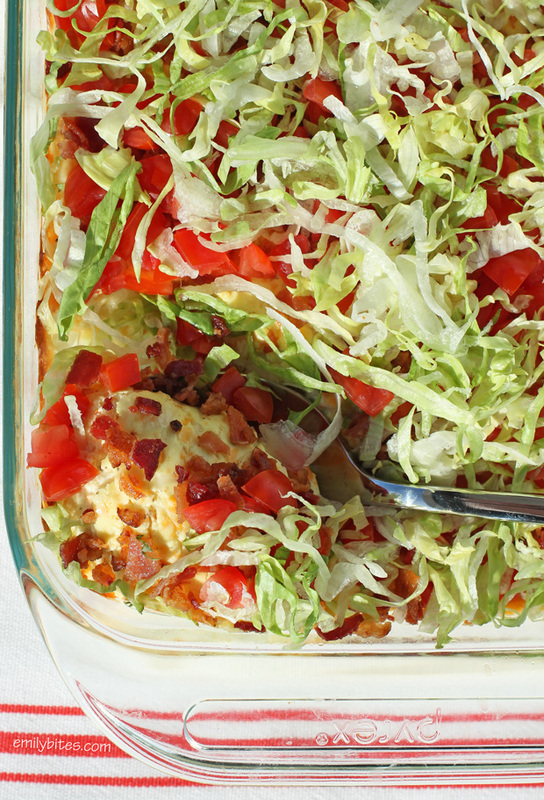 Super cheesy with smoky bacon, juicy tomatoes and crisp lettuce. It tastes like an absolute indulgence. Every time I’ve made this I’ve played around with lightening it up, and today’s post is the finished product. It tastes every bit as decadent as the original, but it’ll only set you back 134 calories or 5 Weight Watchers SmartPoints for 1/3 cup. That’s a steal! I typically serve this dip with baked tortilla chips, but crostini, pita chips, pretzel thins, crusty bread or any other dipper would also be delicious. I even spread some of this dip on a barbecue chicken breast and had it for lunch today and it was a magical pairing. 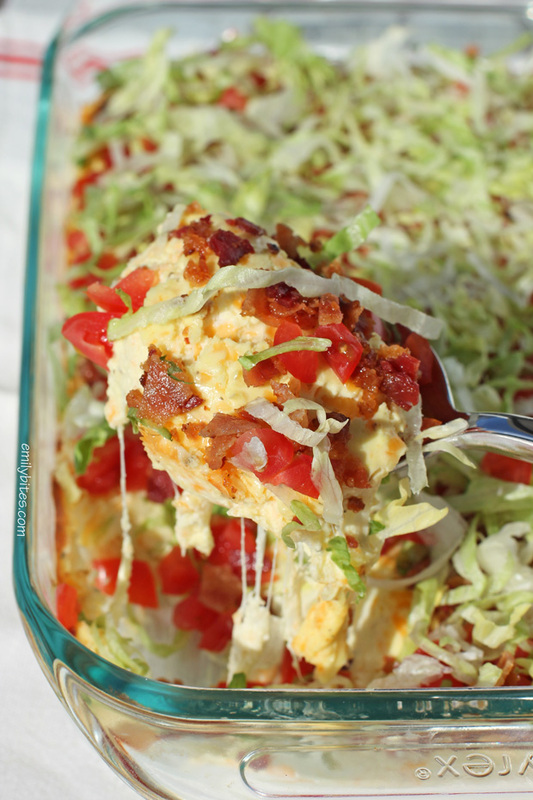 This dip is certain to be a crowd pleaser, it always has been for me! If you’re on the hunt for more delicious dip recipes, check out my Greek Layer Dip, Spinach & Artichoke Dip, Hot & Cheesy Bean Dip, Beefy Enchilada Dip, Caprese Dip, Pepperoni Pizza Dip and more in my Appetizers category! Cook the bacon according to package directions until crisp and crumble or dice into small pieces. Note: I like to bake my bacon in the oven on a baking sheet at 400 for around 15-16 minutes (cooking time may vary). Set aside on paper towels. Pre-heat the oven to 350 and lightly mist a 2 QT baking dish with cooking spray. Combine the cream cheese, sour cream, cheddar, Mozzarella, mustard, Italian seasoning, garlic powder, ¼ cup of the crumbled bacon (reserve the rest for step 3), salt and pepper in a large mixing bowl and stir together until thoroughly combined (you can also use an electric mixer to save time and arm strength). Transfer the mixture to the prepared baking dish and spread evenly across the bottom. Bake in the oven for 25-30 minutes. Remove the dish from the oven and sprinkle with the remaining bacon crumbles, the diced tomatoes and the shredded lettuce. Serve hot. I feel like this would be an amazing grilled chicken topper. Or even dip grilled chicken into it! Yum! Definitely looks amazing. Any cheesy dip is a winner to me! I love this BLT version!! I’ve never baked bacon before – what do I need to know? Is there going to be grease splatter everywhere? Thanks Emily! I lay my bacon on a wire grill over a baking sheet with a lip that way the bacon doesn’t lay in the grease as it cooks. This is just a perfect recipe for a nice warm, sunny day sitting on a deck or patio enjoying the day. Do you think I could prepare this dip ahead of time and just pop it in the oven when I’m ready for it?? I am planning to make this for my book club meeting, but would love to be able to prepare it ahead of time (meaning the night before)! This dip is delicious and so easy to make! I made it for two separate Memorial Day bbq’s this weekend, and it was a crowd pleaser at both. Everyone requested I make this for every party we have this summer! I just discovered your blog a few weeks ago, and have yet to be disappointed by any recipe that I tried! 🙂 Thank you! Hi Peeps! What do you serve this with? Crackers, Chips, bread? I’ve actually served it with all of those things! I like it with tortilla chips a lot. After heating this, is it still going to be good as it gets colder? I am making this for Bunco and not everyone eats at the same time. I am excited to try this with some shredded chicken ,yummy .